Once you’ve set up some backyard birdfeeders as described in Part 1, go beyond the simple pleasure of watching birds with these few steps, outlined below. You’ll be wowed by their beauty, behavior, migration patterns, survival skills and “ecosystem services” (how they keep our environment going). Birds are a never-ending source of stimulation for both the intellect and the passions. You may get hooked. Children love details. 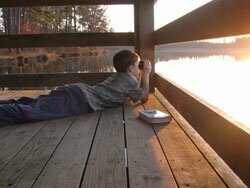 Their God-given capacity for classification and memorization is often applied to Thomas the Tank Engine or Pokemon; introduce them to the natural world and they’ll never run out of material! Birding is a great way to start. Their enthusiasm for being outside will grow, with all the benefits that brings. Plus they’ll develop a natural excitement about science that school work often unintentionally stamps out. 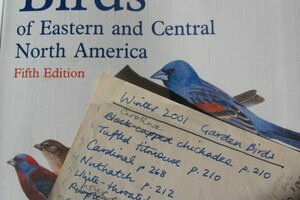 Check out Cornell University’s bird identification tips on the web. Download and print their excellent free posters of common feeder birds. Choose a field guide such as Peterson’s or Sibley’s, relevant for your part of the country (guides that cover the entire nation are somewhat overwhelming and slow down your bird identification). 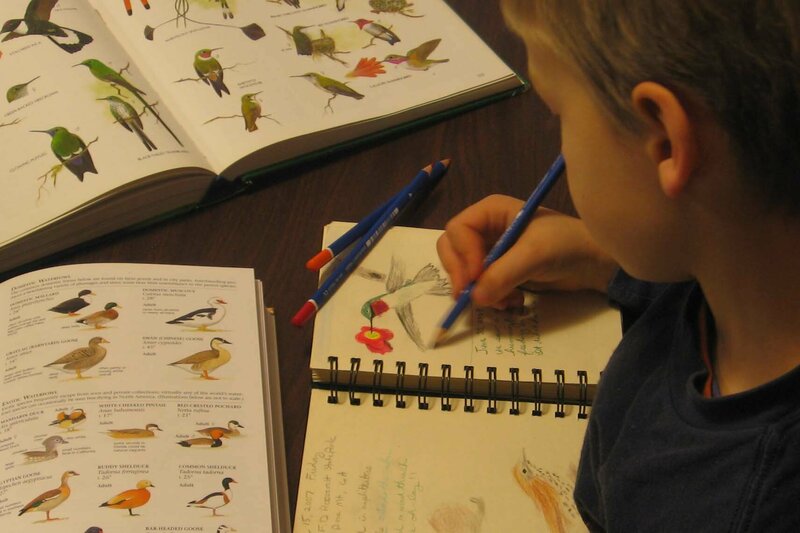 We also recommend this Young Birder’s Guide for both young and old alike, Backyard Birds of Winter, and Finding Your Wings, a great workbook on the nuts and bolts of identifying birds. With your children, be enthusiastic and focus on sharing the experience of discovering something new together. Don’t get discouraged if your child’s attention span is very short. If the child shows zero interest, don’t frustrate them by forcing them to do it, that won’t foster a love of birds! 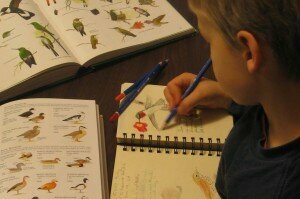 With your children, keep a notebook or journal listing the species you see, noting the date. Or just tuck a piece of paper in the field guide for your list. Copy an illustration from the field guide of birds you’ve seen which you especially liked. Colored pencils are great, but crayons and markers work too. Even if you don’t consider yourself an artist, drawing requires close study of the bird’s details (“field marks”) and helps print them in your memory. Draw with your children, either work on the same drawing with them or on separate drawings. Comment on their creativity and effort! Don’t allow critical or negative comments about anyone’s drawings – be positive about your own work too, children will copy your attitude to your own work! We’ll provide more pointers on drawing from nature in future posts. Bring together children's love for critters and creativity; learning happens naturally! Get some decent binoculars so that you can study the field marks, identify species more easily, and marvel at the details! Hang out with experienced birders – friends who enjoy birding, either watching a feeder or going for walks. Or contact your local Audubon chapter or check out the wildlife division of your state’s Department of Natural Resources for more opportunities to learn. 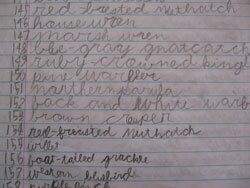 Some kids really get into their "life list of birds"
Next, you can start planning some simple landscaping changes that will both attract more birds and give it aesthetic value next winter when the colors have disappeared. Look for future posts on working as a family to assess your yard and dream up some do-able plans for creating a beautiful (and edible) haven for people and wildlife this year. The Cornell Lab of Ornithology is a bird science powerhouse, with outstanding web-based resources for individuals, families, and schools. Their Project Feederwatch is a winter bird count in which citizens’ backyard observations are used for critical scientific studies of distribution, abundance, range, behavior and disease. An easy way to get your kids involved in real science in their own backyard! The National Audubon Society has an excellent, very informative website full of gorgeous photos and great resources, and they also hold a longstanding winter bird count. 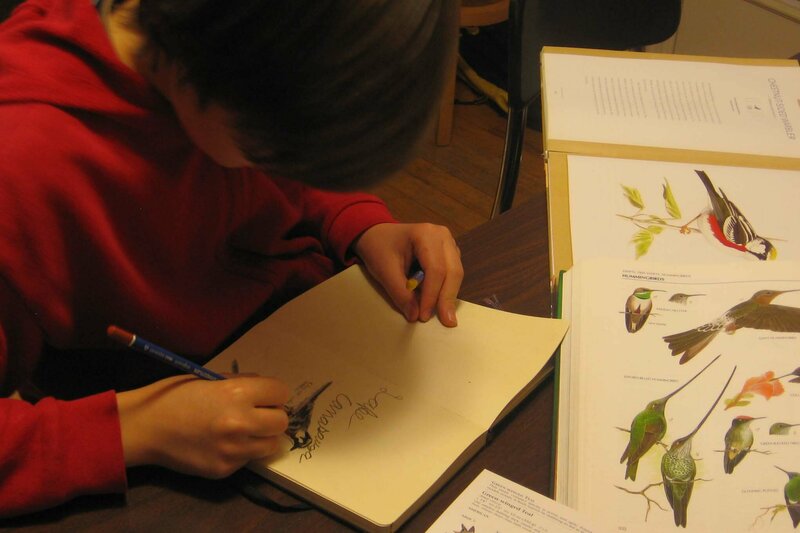 Local Audubon chapters hold educational seminars and birdwatching walks throughout the year. I love this post. I’ll have to check out the rest of your site! !